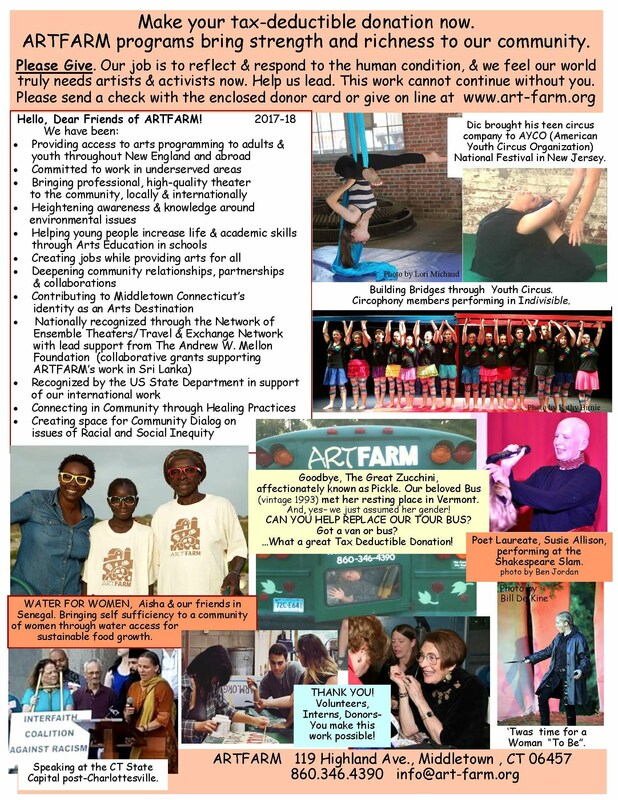 Help ARTFARM grow--quick & easy online donations Click above! For ARTFARM video samples, scroll down to the bottom of this page! 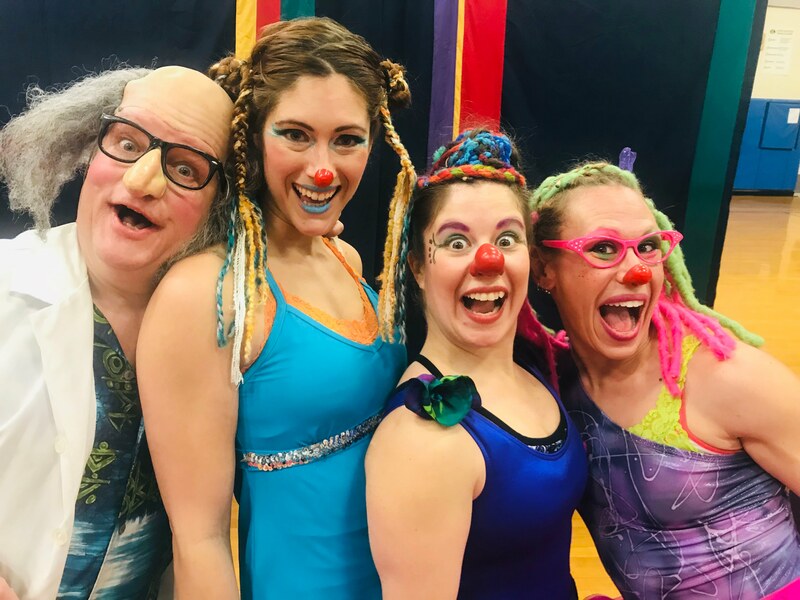 Our Latest 'State of the Onion'- Newsletter is below! Please help keep all this exciting work going with a generous donation TODAY! 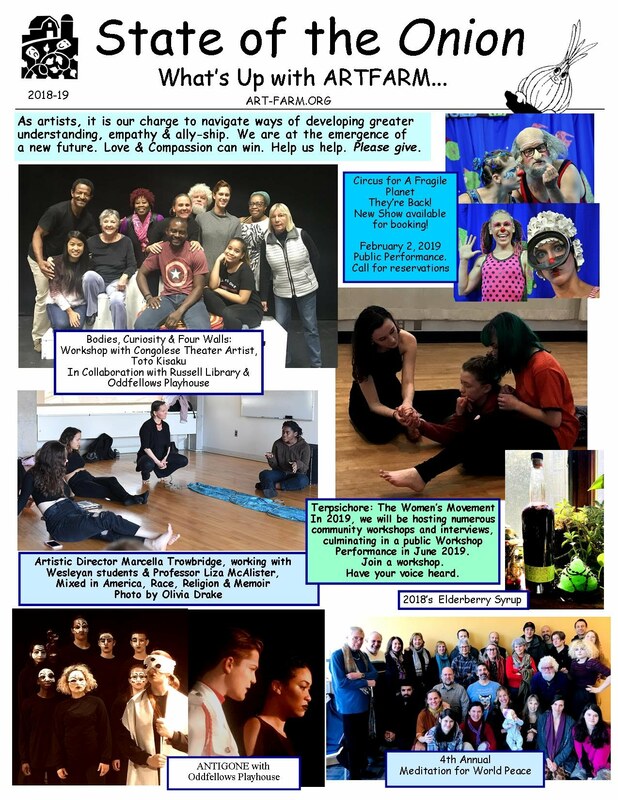 Thanks to our Funders: 111 Sunnyside Charitable Trust; Middletown Commission on the Arts; Pratt & Whitney; Community Foundation of Middlesex County; US Department of State; Network of Ensemble Theaters/Andrew Mellon Foundation; Fidelity Trust; Connecticut Office of the Arts/REGI Grant; and many generous individual donors and volunteers! school, environmental festival, nature space, kids/family fest? 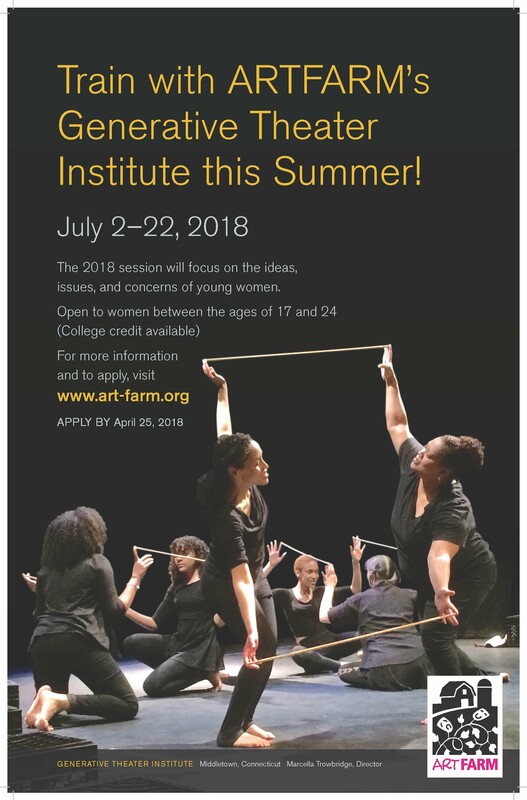 Antigone, Directed by ARTFARM Artistic Director Marcella Trowbridge, received a beautiful response. ANTIGONE is ExTrAOrdINarY. Beautifully directed! Gripping, moving, perfectly analogous to us (We the People Ruled by Agent Orange), gorgeous minimal and flexible stage set and 45-degree-angled-dynamic room, and beautifully acoustically balanced, subtle, minimal sound track, powerful acting, perfect pacing, choreography, and a strong strong sense of group dynamics. a family of actors, auteurs, and Arcturians (who teach that the most important ingredient for thriving in the fifth dimension is: LOVE). Antigone was an enormous gift. You are a masterful director. We who have grown together for years, are now confronting national and global problems together. And I like to think that you, Marcella Trowbridge, in your directing of Sophocles' Antigone, were holding hands across the generations with him and with Brecht and Malina, carrying forward their intents as with a huge banner..
Antigone is the perfect Greek play for these times. And you were the perfect director. 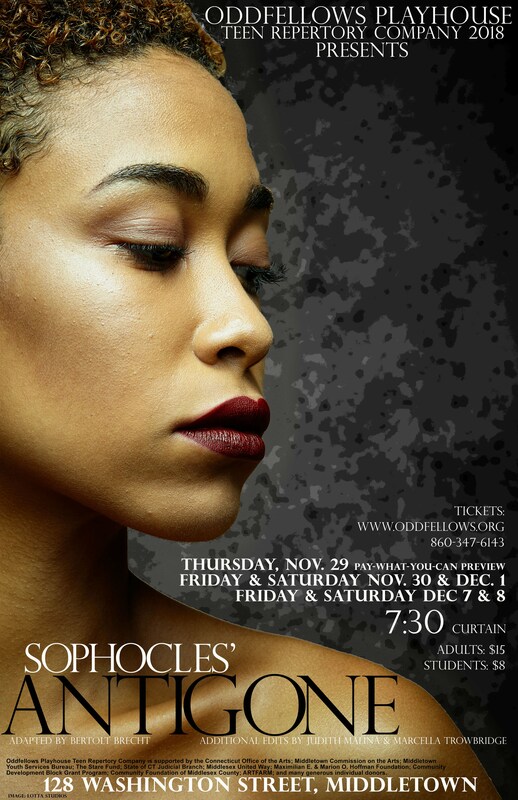 in directing Antigone, you used your Craft to speak to the world of Justice, Betrayal and Hope. Antigone was incredible. Your Kreon: nasty and hateful, Trump on steroids, convincing both in spoken expression and body language. The choreography of the chorus was so well done. 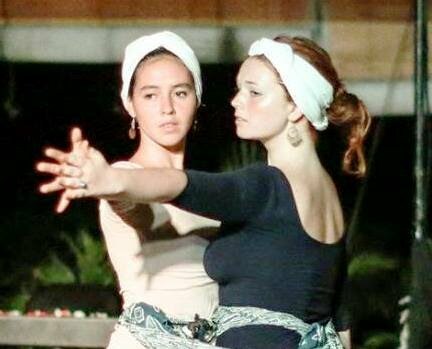 The Elders' ensemble work, their pounding, masks, and coordinated movements made our hearts pound. Beautiful production! 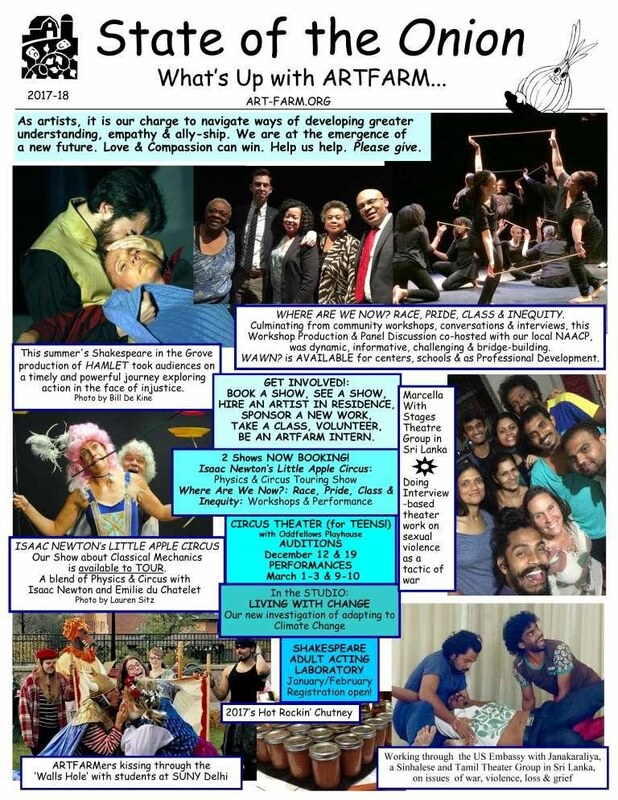 ARTFARM Artistic Director, Marcella Trowbridge, is collaborating with Oddfellows Playhouse on a production of ANTIGONE. 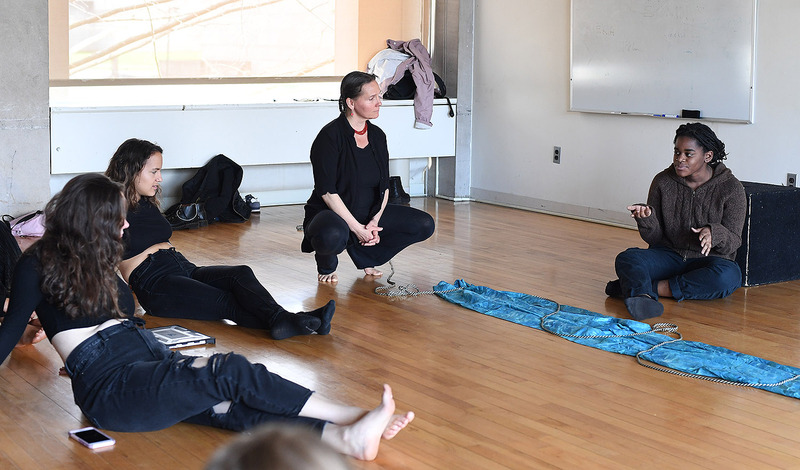 Artistic Director, Marcella Trowbridge, as Artist in Residence at Wesleyan University, 2018. Mixed in America; Race, Religion and Memoir. To see photos by Bill De Kine of ARTFARM's Hamlet production, link to Shakespeare in the Grove 2017. Thanks to Lloyd Langevin and Dan Nocera at MxCC for helping to make this happen! 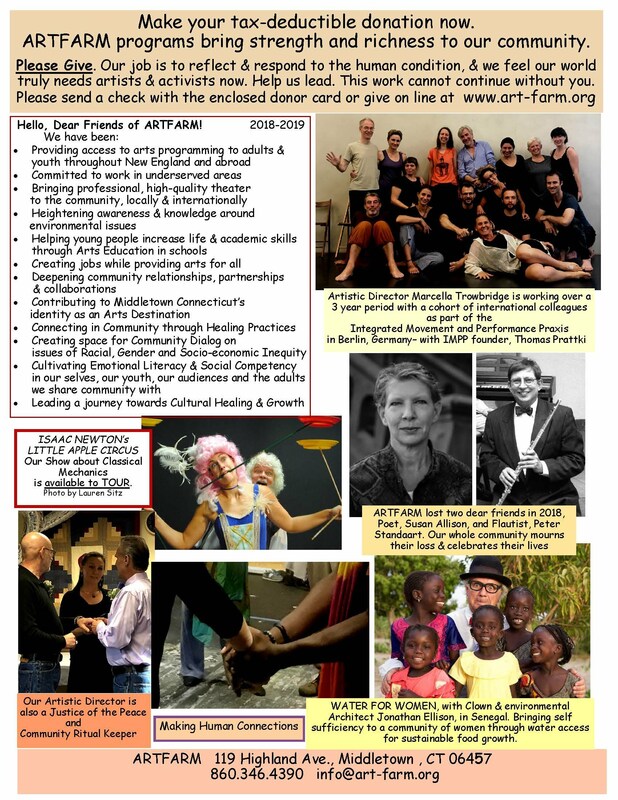 For more info about Little Apple Circus, look HERE or contact info@art-farm.org. 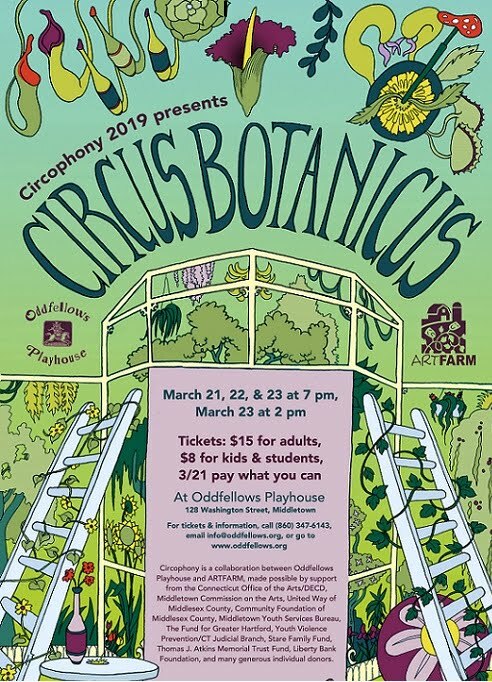 what's going on at ARTFARM!